‘ It is not our differences that divide us. It is our inability to recognise, accept and celebrate those differences.’ Chimamanda Ngozi Adichie, Nigerian author. 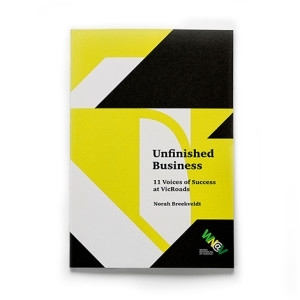 Breekthrough Strategies was delighted to be commissioned by VicRoads to produce and publish Unfinished Business – 11 Voices of Success at VicRoads (2016), as part of its commitment to the creation of a culture that embraces diversity and inclusion. Unfinished Business contains the memoirs of eleven courageous and inspiring VicRoads people who are at the top of their game. They share some very personal stories about their career journeys, including the hardships and struggles they encountered along the way and their strategies to overcome them. Contact Norah Breekveldt on 0413 274 566 or neb@breekthroughstrategies.com.au to discuss how Breekthrough Strategies can showcase your organisation’s success stories.